Global Animal Partnership Steps 3 to 5+. Confused by head-spinning labels? 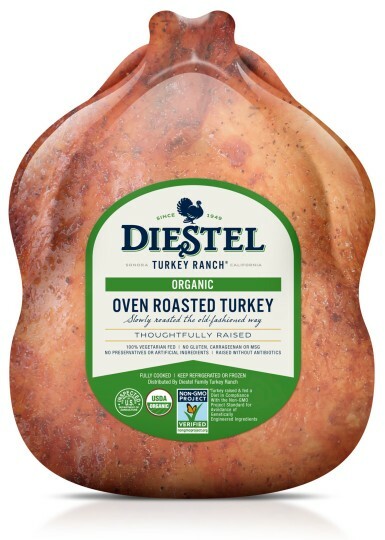 EWG’s turkey label decoder can help. Make your own: Purchase a turkey from a local farm by searching for your city or zip code at LocalHarvest. 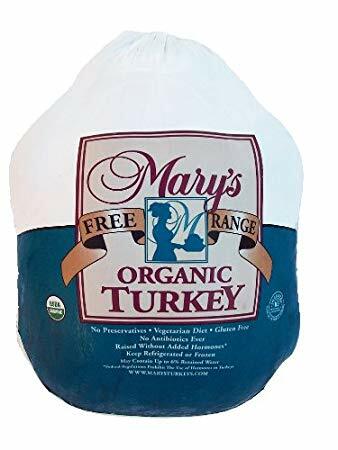 Make it easy: Look for brands at the supermarket that are USDA Certified Organic and Non-GMO Project Verified, like Mary’s or Diestel. Pro tip: Consider purchasing a smaller turkey, like a heritage bird. The USDA estimates 35 percent of turkey meat ends up in the trash each year. Meat has a significantly higher carbon footprint than other protein choices. So eat your vegetables: Choose a more sustainable (and cheaper!) alternative, like stuffed winter squash. Make your own: Check out this Vegan Wild-Rice-Stuffed Butternut Squash recipe. Use organic cherries and consider replacing the rice with quinoa. We advise limiting rice consumption, as both organic and conventional rice may be contaminated with arsenic. Pro tip: Use EWG’s 2018 Shopper’s Guide to Pesticides in Produce® to determine which products have the highest amount of pesticide residue. Choose organic versions of these fruits and vegetables whenever possible. As tempting as the occasional shortcut may be, try to avoid canned vegetables. Most cans are lined with bisphenol A, or BPA, a potent endocrine-disrupting chemical. Instead, grab a reusable bag and head to the vegetable aisle for fresh, organic green beans. Make your own: We recommend this Simple Skillet Green Bean recipe. Make it easy: Frozen organic green beans will also do in a pinch, but opt for whole organic green beans rather than cut, since they retain their nutrients better. 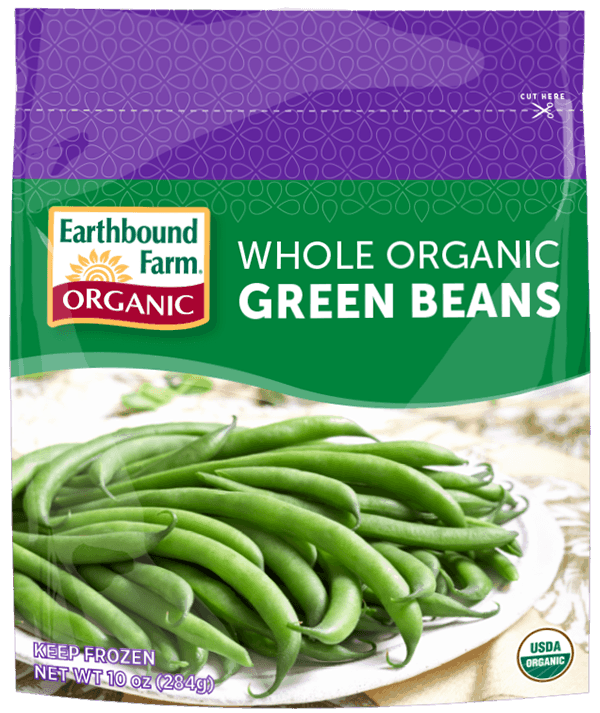 Earthbound Farm Whole Organic Green Beans score well in EWG’s Food Scores, a free database that rates nearly 80,000 foods on nutritional concerns, ingredient toxicity and degree of processing. Pro tip: Other kinds of frozen vegetables may be a good alternative. Visit EWG’s Food Scores’ frozen vegetable category for options. You can avoid feeling groggy after eating this high-carbohydrate dish if you stuff your stuffing with protein, fiber and healthy fats. Consider adding nutritious ingredients like nuts, apples, celery, cherries or cranberries, and carrots. Make your own: Check out this Healthy Harvest Stuffing recipe. If possible, choose to make it with organic celery, cranberries and apples. Pro tip: Replace the low-sodium chicken broth in this recipe with unsalted vegetable broth for a vegetarian-friendly dish. 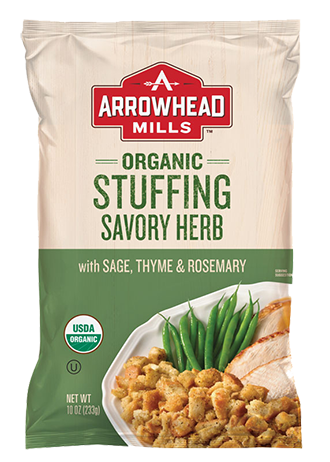 Make it easy: Arrowhead Mills Organic Savory Herb Stuffing is USDA Certified Organic. Potatoes are on EWG’s Dirty Dozen list, so it’s best to use organic. Most frozen or instant mashed potatoes aren’t, so we recommend making this dish from scratch, which will also allow you control how much butter and salt go into it. Make your own: We recommend this Healthy Garlic Mashed Potatoes recipe. Pro tip: Replace a few potatoes with the equivalent volume of cooked kale (or try this kale colcannon recipe) to add extra vitamins, minerals and cancer-fighting phytochemicals to the dish and reduce the carbohydrates. 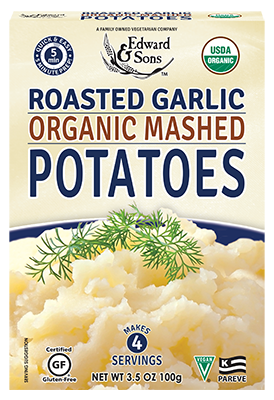 Make it easy: If you prefer to use an instant version, Edward & Sons Organic Home Style Mashed Potatoes and Edward & Sons Organic Roasted Garlic Mashed Potatoes are USDA Certified Organic. Cranberry sauce provides an extra punch of flavor, but it can come at a cost: unnecessary sugar. Try making it from scratch, since most store-bought versions are more than 30 percent sugar. Make your own: EWG recommends this Best Homemade Cranberry Sauce recipe, preferably made with organic cranberries. 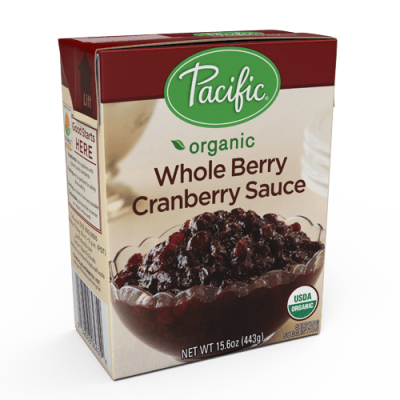 Make it easy: Pacific Organic Whole Berry Cranberry Sauce doesn’t contain any artificial ingredient – although it’s 41 percent sugar by weight. When gravy enthusiasts drench their mashed potatoes in this kind of thick sauce, they’re adding loads of sodium to their plate. Most store-bought products contain more than 20 percent of the National Academy of Medicine’s recommended daily sodium intake. You might want to make the gravy yourself and even consider a vegetarian option. Make your own: To cut the salt content, try using a low-sodium broth to make your favorite recipe. 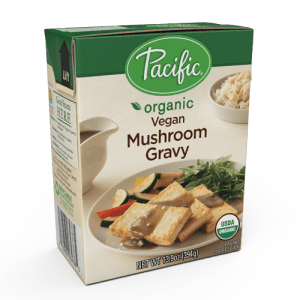 Make it easy: ­Pacific Foods Organic Turkey Gravy and Pacific Foods Organic Vegan Mushroom Gravy are USDA Certified Organic. Who doesn’t love eating dessert as a side dish? Replace the typically high sugar ingredients while preserving much of this dish’s sweetness by using seasoned nuts, toasted organic oats, coconut flakes or pineapple for a healthier yet equally decadent dish. Make your own: We recommend this Healthy Sweet Potato Casserole recipe. If possible, use organic apple sauce. 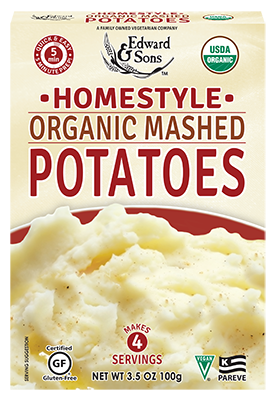 Make it easy: Simple Balanced Organic Mashed Sweet Potatoes score moderately in EWG’s Food Scores. However, if you have guests who are watching their salt intake, they may want to skip them. Whether making your special pumpkin pie or pumpkin soup recipe, choose a puree packaged in a carton or BPA-free can. 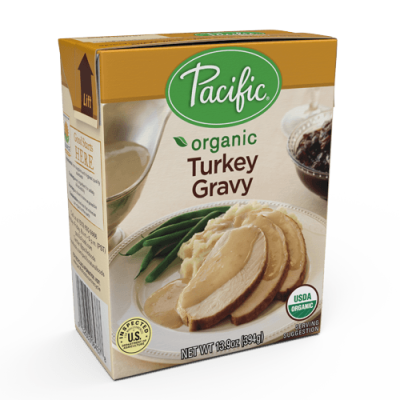 Make it easy: Pacific Organic Pumpkin Puree comes packaged in a BPA-free carton. Not only can you control the amount of salt, sugar and other ingredients added when you do the cooking yourself, you can also reduce the amount of waste produced during Thanksgiving, maybe even save some money. And that’s a lot to be thankful for!